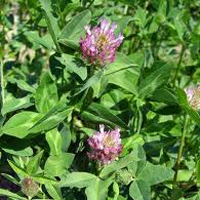 Red clover diploid variety MILENA; intended for the mowing use in the field. It is possible to sow it as one specie (pure sowing) or to sow it mixed with grasses for one-year or two-years using period. By pure seed sowing yield of fresh and dry weight - is from quite large till large; by mixed sowing - average. The overall protein content in the dry matter - is from average to quite large. Protein yield - big. The term of flowering - medium. Winter hardiness - medium. Rate of regrowth in the initial period of vegetation (spring) and after mowing - average. 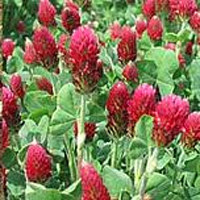 Shows the average susceptibility to clover cancer and medium till little - to powdery mildew. Perennial plant, medium height (up to 45 cm). It is one of the most valuable plants within forage area, it contains a lot of protein and very long is meaty. It is resistant to chewing and trampling. Due to stolons quickly fills the trodden places. Honey giving Plant. Annual plant, medium height (50 cm). 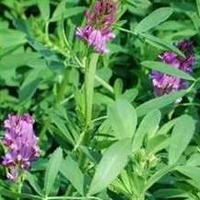 It is a fodder plant, legume. Is used as fodder and used for successive secondary crops feed. Perennial plant used in rotation 2-3 years and longer. 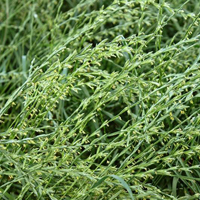 Due to its high proteins content it is an important fodder plant. Part of many fodder grass mixtures, suitable for hay and silage. 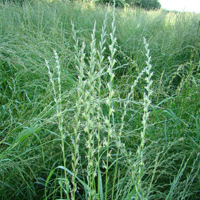 It is low, tuft grass, arising up to a height of 50-60 cm. Leaves in bud are folded up, leaf lamina flat, grooved, bottom glossy (but less than the italian ryegrass). Short tongue ca. 1 mm, cut down. Inflorescence is ear double-sided up to several centimeters. Ears are the opposite, 12-15 mm length. Italian ryegrass is the most important grass on permanent assets and alternating pastures. The grass need to be sown on fertile soils. Good use of high doses of nitrogen fertilization. Fodder grass- depending on codntions one-year or two-years growing plant. Regarded as one of the best fodder species. This is tufty grass, up to 1 m high or higher. Leaves in bud are folded up (difference from perrenial ryegrass). Leaf lamina are 4 mm wide, grooved, naked, on the bottom side highly shiny and from the top a bit rough. Tongue is longer than the base of the lamina (what differes this grass in stage without flower from similar to her - meadow Fescue). Inflorescence is intermittent ear, length 20-25 cm, slightly pendulous, ear put into 2 rows, opposite. 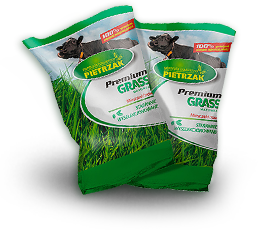 Italian ryegrass is most lush grass with very good fodder value, featuring good usage of fertilizers and water. However it is sensitive to harsh and snowy winter. 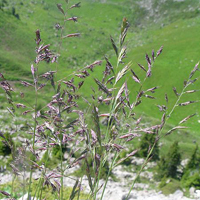 Grass perrenial, height from 40 to 90 cm. Leaf in bud folded up. Leaf lamina without spurs, width 4-6 mm, brushed on both sides, grey-green. Tongue highest leaves length up to 5 mm, lower leaves 2-3 mm, quite wide, pointed at end. 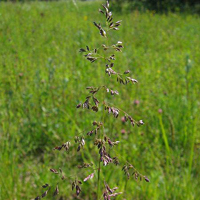 Inflorescence is a bunch - ear shaped, length 20 cm, diameter 6-8 mm, cylindrical, tapered at the base and at the top (which differs from the inflorescence of meadow foxtail - tapered gently). Timothy is resistant to chewing and trampling, suitable for heavy, cold, even slightly wet peats and fields situated in the mountains. This is high fodder value grass, good winter hardiness, suitable to all kinds of legume-grass mixtures. 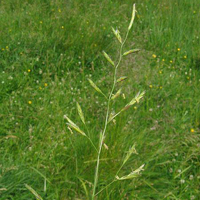 Perrenial grass, from 30 to 80 cm height. Leaf lamina width of 2-3 mm. Leaves are usually flat width of 3-4 mm, grooved, with numerous nerves, on the upper side slightly hairy. The uvula is very short. Inflorescence is topping with length of 6-15 cm long, with an ear on the top. Branches of the inflorescence during flowering stand off. Red Fescue occurs in two forms, which are adapted to different conditions: cluster and creeping. First - creates equal , dense clumps. Appreciated in the mountains, where suitable for the mowing use and grazing as well. Creeping festuca is a grass of the multilateral usage, easily adapting to the conditions of pastures and meadows located in inferior positions, from an average of moist to wet. It is very tough on trampling and chwing, it is able to create a steady turf. 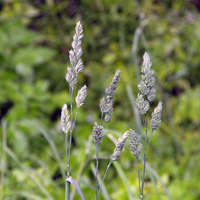 Perrenial grass, height 60-110 cm. Leaf in bud, folded up. Leaf lamina are flat, width of 4 – 6 mm and a length of 10-20 cm, bottom shiny, at the base have distinct Spurs. Tongue short length 1 mm, cutted down. Leaf sheath is not healed. Inflorescence is erect topping or slightly slooped, length to 20 cm, end with a single ear. In the lowest floor of the inflorescence there are two branches: one longer with a few ears, second shorter with 1 or 2, rarely 3 ears. 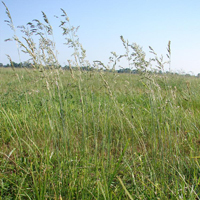 Meadow Fescue is recommended on the meadows and pastures moist and moderately humid, cultivation goes up on almost all soils except very poor, acidic and dry. Is resistant to mowing and pasture. 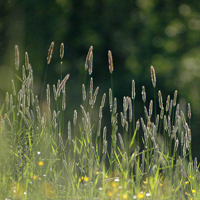 Perennial, wind pollinating grass, resistant to adverse climatic conditions. Because of the low requirements, is applied to the devastated areas. Characterized by good nutritional values. Cocksfoot is perrenial grass, height up to 150 cm, blooms in late May or early June. The leaf is in a bud folded up. Leaf lamina without spurs, flat, up to 10 mm width with deep trough and nerve strongly standing on the lower side of the leaf. Tongue length to 4 mm, pointed at end and frayed (mostly) on the edges. Leaf sheath flattened, rough, almost all healed. Cocksfoot inflorescence is a plainly raised topping with ears densely focused on the ends of the branches and collected in bunches. Dactylis glomerata best goes on good soils. Good use of high doses of fertilizer nitrogen. 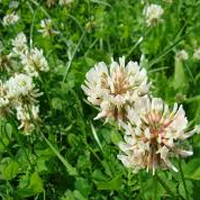 Valuable grass on meadows moderately moist, however on the pastures desired only in exceptional cases, because the fast lignifying, which lowers the value of feeding (must be frequently chewed or cutted). Poa pratensins is one of the most perrenial grasses growing up to 50-75 cm. Leaves in the bud folded up. The basis of leaf lamina without spurs. Leaf lamina flat with two grooves on both sides along the nerve. Leaves from the bottom shiny, width up to 5 mm. Tongue short 2-3 mm, blunt cutted. Inflorescence is topping length of 10-15 cm, patula during flowering and rolled before blossom. On each floor of the topping grows out of 5 branches, arranged opposite in floors. Poa pratensis fits almost all permanent usages, except dry, wet and very heavy soils. Best goes on on the loose and humus soils. There are two forms of the grass: broadleaf - high fodder value and narrowleaf - less valued, often going on dry positions. CloseOn this web site are used files cookies is collected for statistical purposes and used for the proper operation of the website. Conditions of storage or access cookies, you can change your browser settings - failure to change browser settings is clear to consent to their store.